Does the library have all the textbooks on reserve? Through a Student Equity grant and faculty donations, both libraries strive to keep a copy of each required textbook on reserve. However, it is not always possible to obtain copies of all textbooks. If you are unable to locate your textbook, please contact the MVC Library Reference Desk at 951-639-5450 or the SJC Library Reference Desk at 951-487-3452 for assistance. Can I check a textbook out of the library? Textbooks can only be used in the library on a first-come, first-served basis. You can read them in the library, make copies of pages at the copy machine, or scan pages to your USB drive using the library's document scanner (SJC Library). Please return books promptly to the textbook shelving area so that other students may use them. How do I find out if my textbook is available on reserve? If you are in the library, scan the open textbook shelves for your book. Books are arranged alphabetically by subject and course number (e.g. English 98, 101, etc.). You can also search for textbooks on the library homepage. Click on the "Textbooks/Reserves" tab and search using course subject or course abbreviations (see below). You may also add your course number. For example you can search by: English, ENGL, or ENGL 101. If you can't find your book, ask for assistance at the Reference Desk. Where are the textbooks located? 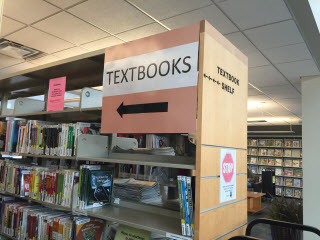 In the Menifee Valley Campus Library, most textbooks are located in the open textbook shelves near the reference desk. A smaller collection of material is held behind the circulation desk. These materials typically consist of lab manuals, workbooks, DVDs, videos, and articles placed on reserve by instructors. 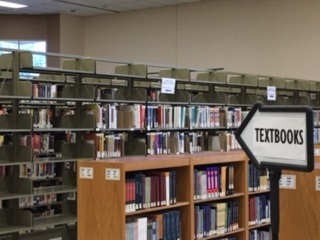 In the San Jacinto Campus Library, the textbooks are located in open textbook shelves in the first row of the book stacks. Instructor-assigned articles, a few books, CDs, DVDs and maps are reserved behind the circulation desk.